Twile is a free, interactive, family tree website that features engaging material for kids and adults. 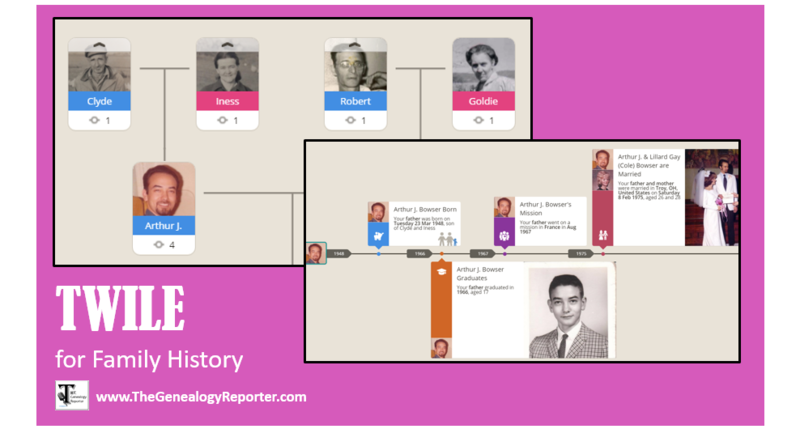 The tree and timeline features will have even the most reluctant genealogist participating in family history in no time. Twile, pronounced like putting a “t” sound on the front of the word “while,” has been listed in the UK’s top 50 up-and-coming innovative companies and I want to talk about it! I first learned of Twile at the end of last year and was able to meet Caroline Brooks, their marketing and PR person, at RootsTech in February. I was drawn to the company because of their mission to make family history enjoyable and free for everyone. I would love to say that my kids are just as interested in family history as I am, but they aren’t. Could it be because the pedigree charts and family group sheets are a little on the boring side? Traditional family history forms might seem dull to today’s tech savvy children. Not only am I trying to convince my kids from time-to-time that family history is fun, but my parents and sisters, too. I get the occasional eye roll when I call them about the new probate record I found. Can you relate? With Twile, anyone can create a fun, interactive tree that is more than just names, dates, and documents. It’s more about family events through history. In fact, it’s the Timeline feature that is really fun and engaging. As you can see, the tree is just a basic photo and first name. Really easy and simple for the kids to learn the names and faces of their ancestors. And, it won’t overwhelm the adult that just wants to see a snapshot of the family tree. To see an individual’s timeline, hover over any person in your tree and choose the timeline option. 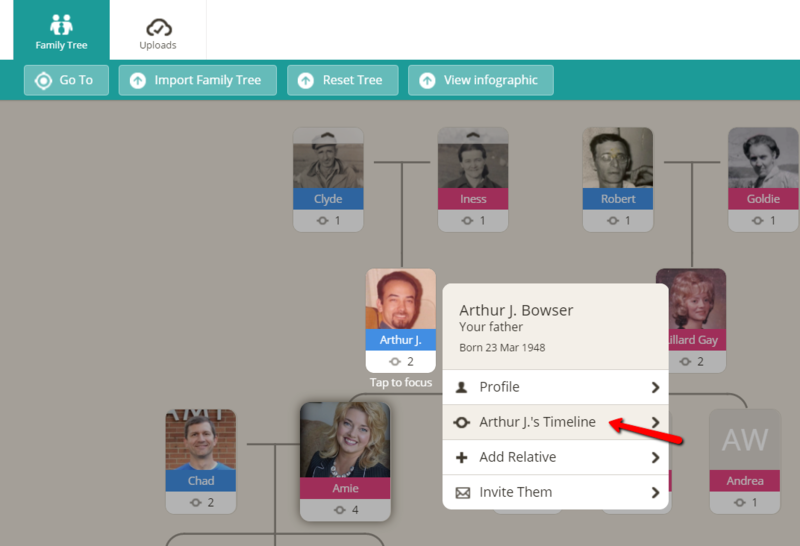 The timeline is automatically populated with whatever information you gave when adding the person to your family tree. However, you can easily add lots of events to your timeline with these easy steps. You can choose from over 60 milestones, or create a custom milestone. In the example I am going to share with you, I chose to create a custom milestone for the farming accident my Dad was in at age three. Whatever milestone you click, a new window will pop-up and you can add all sorts of data and images to the event. Below, I added a picture of Dad when he was about 3 years old, a short story of what happened, an image of what the plow looked like that ran him over, and I added the address of the farm where they where living. Another fun and interactive feature on the timeline is the ability to add a location that is then enhanced with Google Earth. When you are done adding everything you wish, just click the little “x” icon at the top right to close. Everything is saved and you pop back over to the timeline and your new event shows up in just the right place. Isn’t that neat? I am especially excited to share this with my little nieces age 5 and 3. They are going to love this! It’s just like so many of the fun little games they are playing on their tablets, computers, and Mommy’s phone! With the dawn of internet and web-based games and tools, gone are the days of boring family history. 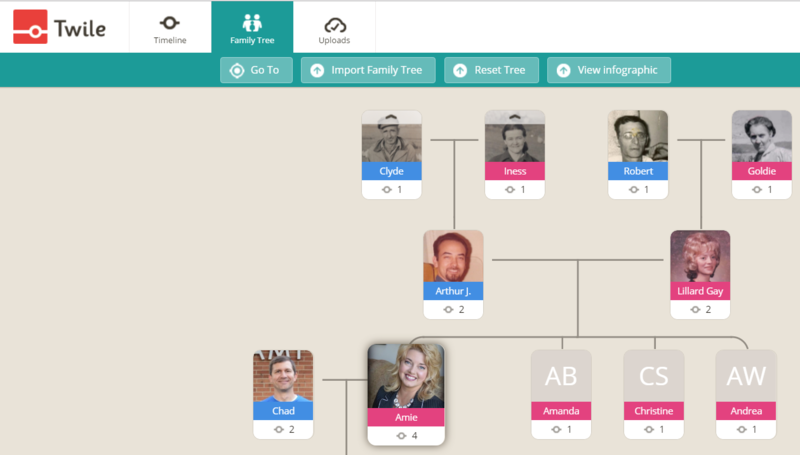 Twile is just one of the many amazing ways you can create engaging family history for the reluctant genealogists in your family. 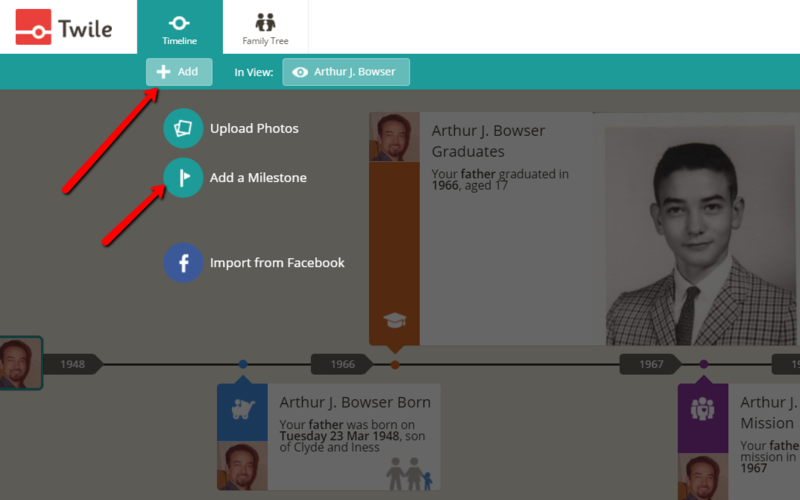 Now that we’ve talked a ‘Twile, maybe you would like to start creating your own timelines for family history. Click here to get started. It’s free, engaging, and a little addictive! 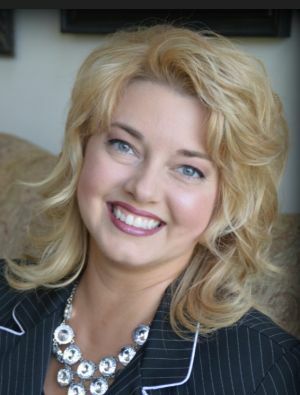 To learn more about engaging and unique ways to enjoy family history, read “Trying to Stump Big Grandma” and “Genealogy Retreats vs. Genealogy Conference.” Don’t forget to subscribe to The Genealogy Reporter for news and education in the field of genealogy and family history. Thanks for reading, friends. Disclosure: The Genealogy Reporter has an affiliate relationship with Twile and receives compensation for Twile registrations. The Genealogy Reporter also does not enter into such a relationship without full support and true enjoyment of the product. DNA Day Sales are Here! I spent hours putting information into my Twile timeline. I really appreciated the benefit of being able to upload data from my Family Search account. The timeline feature is probably the best feature of this service. Twile does NOT let you remove or delete your tree/GEDCOM. There is also no way to delete one’s account/profile. The only email contact for them, “help@twile.com” bounces back as undeliverable. Twile has recently been purchased by Findmypast. You will need to contact them about problems and concerns with Twile. Thank you for letting us know about this problem! Best wishes!